When it comes to fall nail colours, you can’t get much more autumnal than the Collection Work The Colour nail polish in Scorched Copper. 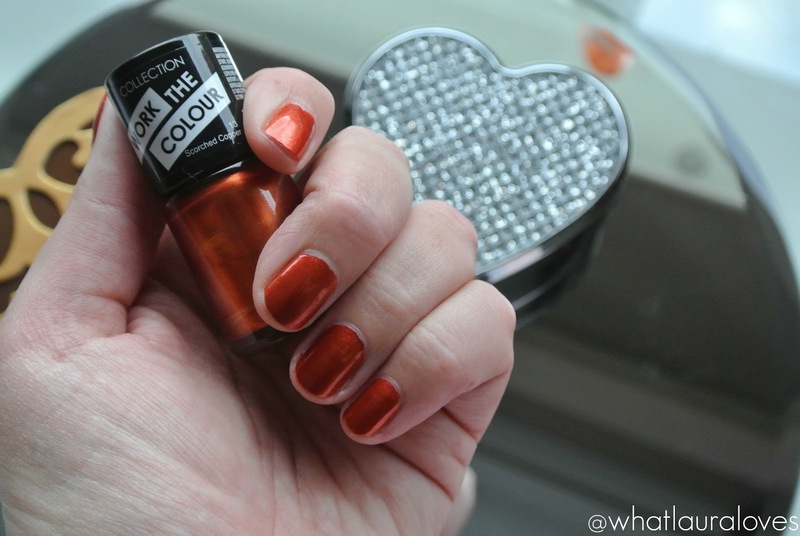 This super pigmented burnt orange metallic shade looks absolutely gorgeous on the nails and draws so many compliments, presumably because its quite an unusual, eye catching colour of nail polish. My friend has a gorgeous little girl with vibrant ginger hair and when I wore this polish around her, she said ‘Auntie Laura, your nails match my hair!’ which made me smile and giggle in equal proportions. This polish is from the Work The Colour line at Collection. It is super pigmented, smooth and even to apply and is opaque in two coats. It dries quickly too. The only disappointing thing about this polish is that the wear time on it is terrible. Without a top coat, I’ve known it to chip on the first day of applying it and with a top coat, I’ll get an extra day or so out of it. It doesn’t bother me too much as I tend to apply my nail polish with a specific outfit or occasion in mind but it is a pain having to frequently reapply. Thankfully, it comes off quickly and with minimal effort with any nail polish remover. For only £1.99, this polish is great value for money and wont break the bank, making it a great way to update your nail polish collection to something autumnal. 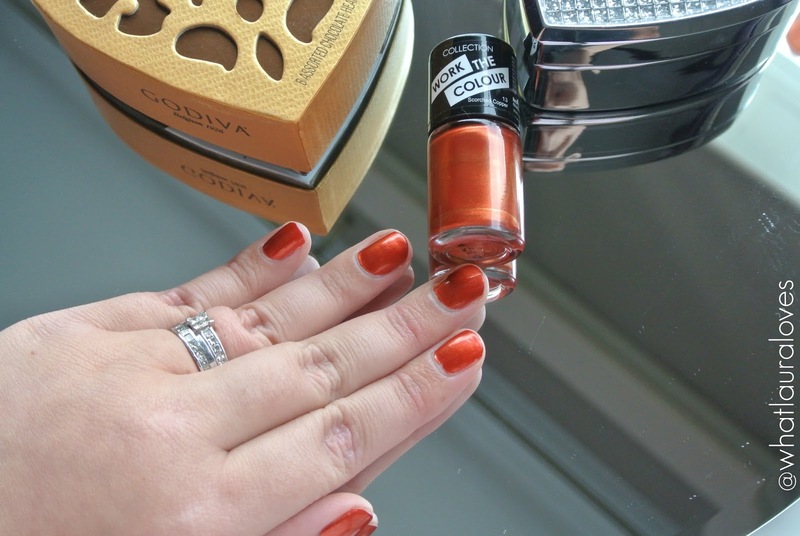 What is your favourite autumn nail polish shade? Ooooh, I saw "Scorched Copper" and I knew I had to check this out. 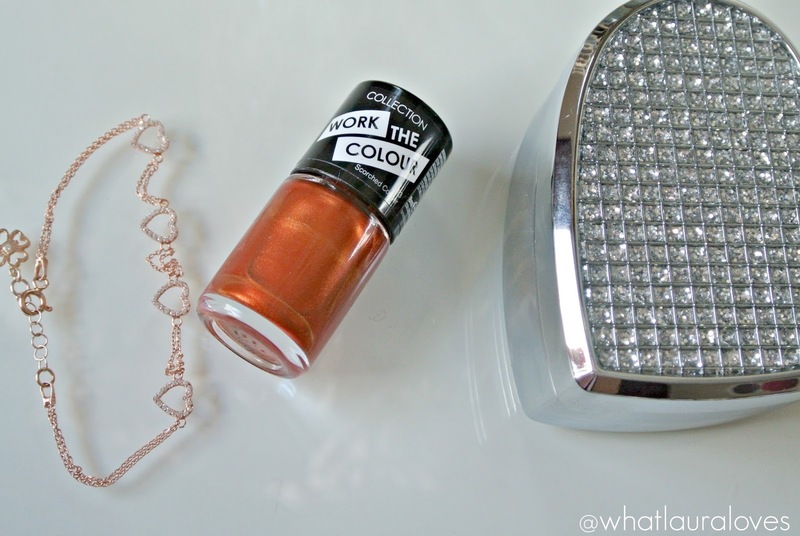 Too bad we don't have this brand because that shade is a stunner! That is such a pretty color. Love it. I forgot I have a similar color, I need to wear it soon! what a pretty shade! And so perfect for Fall!